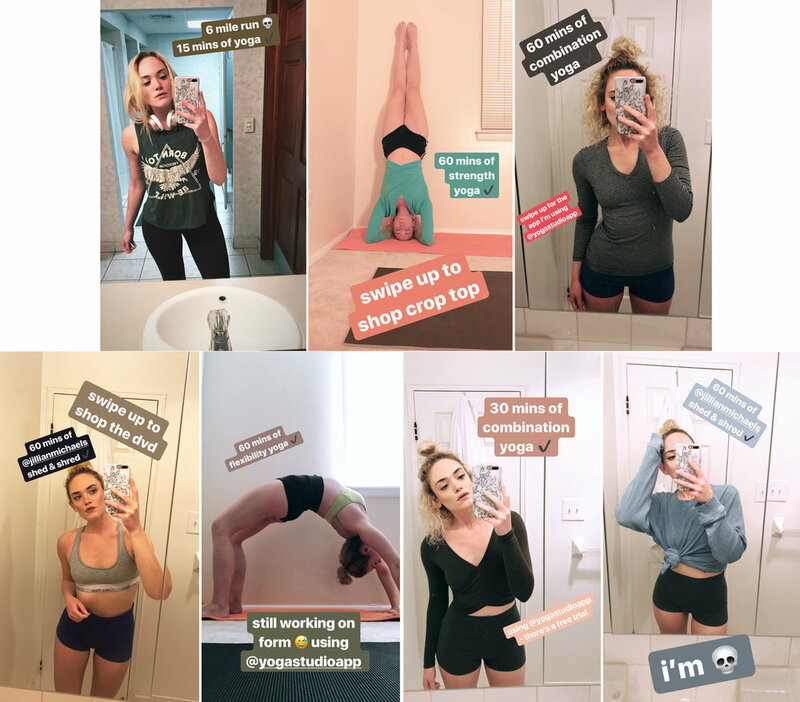 On IG stories, I asked you babes if you'd like more fitness posts and I received such a positive response. To kick things off, I'm letting you in on what my routine looked like the other week. This schedule is completely different from what it has been one or even two years ago. Depending on my health, lifestyle changes, and just plain boredom with certain exercises, I switch things up. I am not following a set plan - I just do what I feel up to. I pushed myself extremely extremely hard before the wedding, so nowadays I'm focused on listening to my body. I was never one for running, but just before my wedding I didn't have access to a pool or a gym and it was great weather outside. I was running 4-5 days a week and really enjoyed the time outdoors. Once it turned freezing, I stopped running and took it easy with the cardio. Now that I have a gym again, I run indoors on a treadmill about once a week. It's not as fun as the great outdoors, but it'll do. I use my favorite yoga poses to cool down afterwards. I love Yoga Studio App. I reviewed this program here back in October and have been using it ever since. The 'Advanced Strength Yoga' class is the most difficult of the classes I've used in the app. It really helped to lean me out before the wedding. This is my favorite class in the app. It's not as challenging as the strength class, but does a few really hard moves to make me feel like I've worked my core. My mom bought me several Jillian Michaels DVDs for just $1 each. These workouts are such a throwback for me. I lost a bunch of weight about 12 years ago mostly due to following workout DVDs, so they hold a special place in my heart. This workout is no joke. I did Levels 1 & 2 together, as Jillian scarily suggested during the intro of the DVD. It included weights, yoga, and kickboxing. As I write this, almost a full week later, I think I'm still sore. I considered this workout a 'rest day' for me. I was so beat after the Shed & Shred and desperately needed to stretch. The advanced flexibility class is incredibly soothing and was perfect way to workout out the pain I felt post Jillian. This class is always more strenuous than I think it's going to be. I typically do the 60 minute version, which has more opportunities for rest between poses. The hair of the dog that bit you, am I right? After completing this workout for a second time, I finally have combated my soreness. Sure, there's still a little pain every now and then, but tackling this DVD twice made it easier to walk again. Jillian, why must you do this to me?